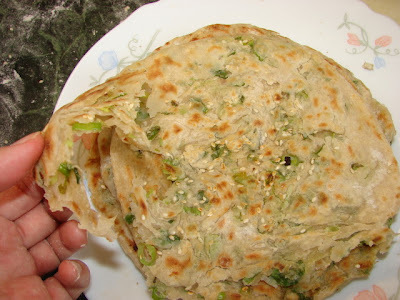 Spring onion or scallion pancakes (chung you bing 蔥油餅) are delightful flaky pancakes, similar to Indian paratha. There are various ways of making these pancakes. This is my favourite method. These pancakes can be eaten on its own with any favourite dipping sauces, or as a wrap like this egg filled pancakes or eaten with a meal. No bad with curry if you don't mind fusion. Here is the recipe, makes 6 medium size pancakes. Dissolve salt in water, then mix with flour to form a dough with a pair of chopstick. No need to knead. Leave to rest for about 20 -30 minutes then knead till smooth. Use more flour if dough is sticky. Leave to rest for few minutes. Then sprinkle flour on working area, roll the dough out very thin. Brush with oil/fat evenly. Then sprinkle on spring onion and a little salt, leave one side of the pastry without spring onion. Roll the dough up. If the dough sticks, lift it up with a spatula. Once rolled up, mark into 6 equal parts. Twist off each piece. Lightly dust each piece of dough with flour. Twist each piece lightly then press from both ends into a disc. 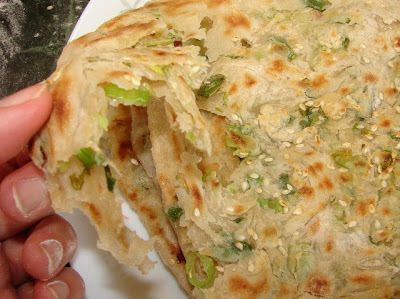 If using sesame seeds, dampen the dough lightly and stick on some sesame seeds. Then roll each disc into a thin pancake, dust with more flour if required. Fry the pancake with a touch of oil. Flip over when golden. When nearly ready, squash the pancake from the side towards the centre to loosen the layers. This step is very important if you like the pancake quite flaky. Ready to eat straight away while hot. Thanks for sharing this recipe. I've tried making this pancake and it taste good =) The problem I encountered was my pancake wasn't as flaky as yours. It's more like crispy biscuit. Could you tell me what has gone wrong? Thanks. Without seeing what you have done, it is difficult to solve your problem. Did you follow the recipe? Did you brush enough oil on the pastry before sprinkling on the spring onion. You need to fry the pancakes at medium high heat so the outside gets brown/crunchy as quickly as possible and inside still soft. Crushing the pancake to loosen the flakes at the end is also important. You're right, the lst time round, I didn't fry them in med high heat and I have rolled them too thin, less than 2.5mm. So happy (^_^)// Thank you for your advise. Thanks for telling m4 it does work! I just made these and looked how they were supposed to, flaky and crispy however, they were lacking in flavor. I'm thinking maybe because I didn't use lard/sesame oil and used vegetable oil/sesame oil. Anyway, I just made these so I could make "chao bing" so I cut them into strips and added to them to the rest of the dish but I will revisit this later and try to find out what I'm missing. Thanks for a good starting off base to work with! - I normally use oil/sesame oil it still very good. Wonder if your sesame oil is pure or mixed and did you use enough.